Alicia Frankovich (New Zealand, 1980) obtained a BVA in sculpture at AUT in Auckland in 2002. Her work is made up of performance, performance-based videos, short films and sculpture. She puts bodies into situations where they play out relations, often testing social conventions and behaviours. 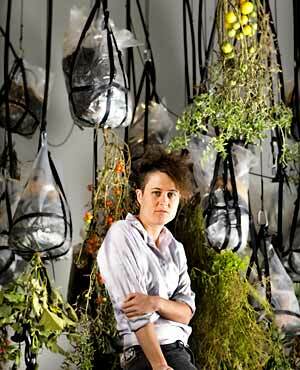 She has undertaken various residencies at AIR Antwerpen, The Firestation Dublin and Gertrude Contemporary, Melbourne. 2014:perf infiltrations, curated by Madeleine Amsler and Marie-Eve Knoerle, WAOP, Geneva; Framed Movements, curated by Hannah Mathews, Australian Centre for Contemporary Art; Le Mouvement; Performing the City: 12th Swiss Sculpture Exhibition ESS SPA, Biel/Bienne, 2014, curated by Chris Sharp and Gianni Jetzer, Switzerland; Crampographies/ Krampographien, curated by Ulrike Gerhardt, Susanne Husse and Imke Kannegiesser, KW Institute, Berlin (screening); Gestures, Splits and Annulations, Künstlerhaus Bethanien, Berlin; 2011; Effigies, Dunedin Public Art Gallery, 2010; A Plane for Behavers, ARTSPACE, Auckland, 2009; Super Segue, Artspace, Sydney, 2009. Recent group exhibitions include: The Walters Prize, Auckland City Art Gallery, Toi o Tāmaki, 2012; Dublin Contemporary; Terrible Beauty: Art, Crisis, Change and The Office of Non-Compliance, 2011; Burn what you cannot steal, Galerja Nova, Zagreb, Croatia, 2011; City Within the City, Artsonje Center, Seoul, 2011; NEW010, Australian Centre for Contemporary Art, Melbourne, 2010; Picturing the Studio, The School of the Art Institute, Chicago, 2009. Recent performances include: A program of artistic interventions … and they installed the office in the tavern, organized by The Office (Berlin) and Le Bureau/ (Paris), 2012” “Drei Schwestern” Berlin and Gaîté Lyrique, “Bar du foyer historique” Paris, Floor Resistance, 2012; Hebbel Am Ufer, HAU 3, Berlin, 2011; Undisciplined Bodies; an Evening Dissolving Social and Spatial Conventions, Salon Populaire, Berlin, 2011.